Efficient daylighting and glazing components that enhance comfort and eliminate condensation risks. Sliding door high performance exit hatch, avoids the need for a bulkhead, allows roof access to rooftop gardens. Daylighting retail environments has been shown to positively affect sales and increase the length of time customers feel comfortable indoors. Architectural roof glass provides green buildings with daylight deep to the interior of buildings with large footprints. 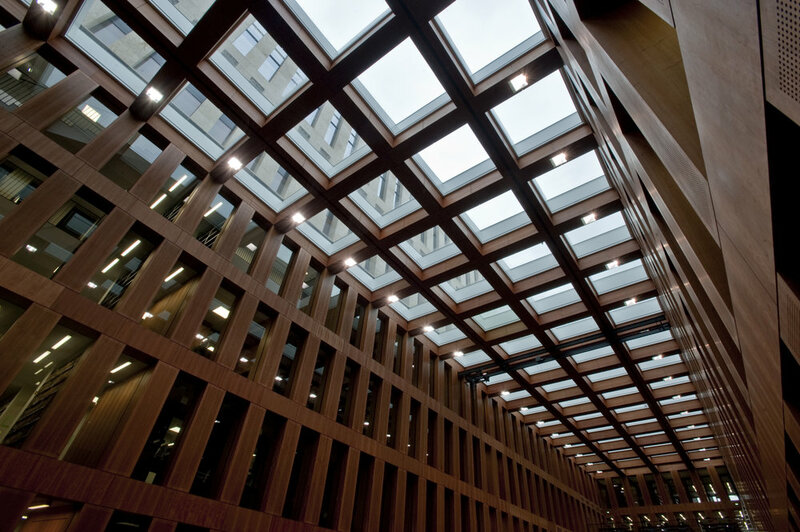 Glass roof systems provide daylight access to offices facing interior courtyard. Drainage must always be the first priority. Looking down through atrium skylights to the office below. Note integrated 3 degree pitch that allow for optimum water management, and avoids stains from standing water. Play between light and structure enhance aesthetics of interior circulation space and make using stairs more attractive. Elementary school library atrium spreads the daylight to make a warm and comfortable learning environment. Balancing visual transmittance with solar heat gain coefficient is key in the energy balance of daylight elements. Operable vents can be integrated into building automation systems to provide natural air exchange during shoulder seasons. 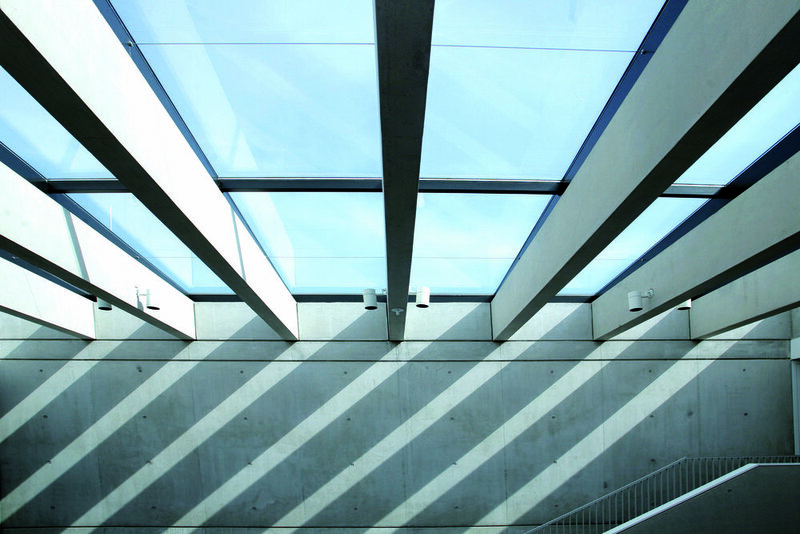 Demand for roof daylighting continues to grow in current architectural design. Yet often, new buildings are covered with glass that looks great in rendering but ends up being very thermally inefficient and regrettably uncomfortable. The performance benefits of daylighting are increasingly understood and documented. Research shows that well-designed, daylight spaces act as preventative medicine for employees, positively affect sales in retail environments, improve health metrics in medical facilities, and help students perform better in school. 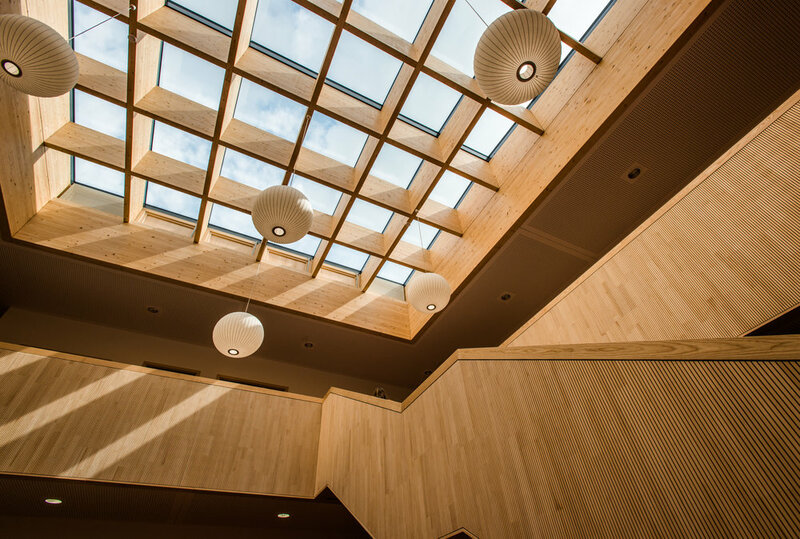 In particular, roof daylighting can be an aesthetically powerful design element, extending the benefits of natural light deep to the interior of a building. Persuasive examples abound—from the ancient Pantheon, to McKim, Mead & White's original Pennsylvania Station, to Frank Lloyd Wright’s Johnson Wax administrative building. But the pitfalls are notorious and have limited the successful implementation of glass roofs in high-performance projects. Summer sun can overheat occupants. Winter heat losses can decimate any artificial light savings. Both scenarios will make occupants uncomfortable. Not only can the sun cause thermal discomfort, but its glare can cause visual discomfort, too. Above all, moisture issues have plagued major glazing elements. Owners don’t care if it’s a leaky connection or a condensation issue—it’s dripping, and they want it to stop. 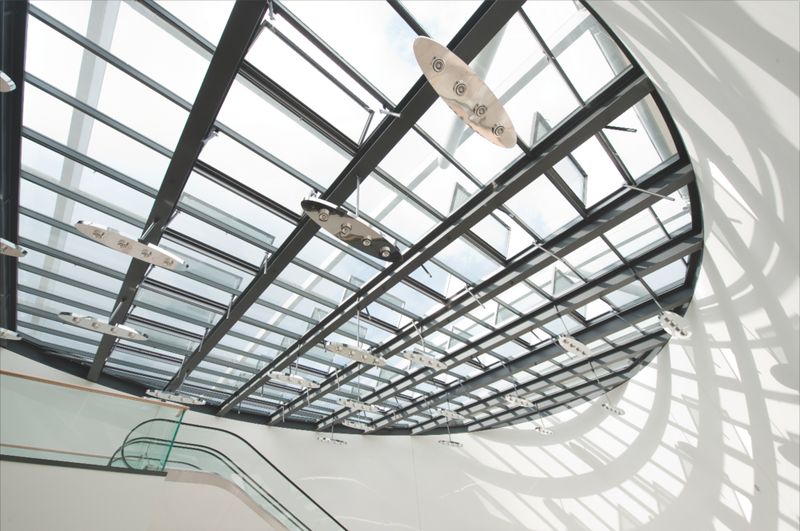 At 475 High Performance Building Supply, we have worked with architects and engineers to deliver the benefits by supplying next-generation glass roof components like the PR-60 by LAMILUX. What we’ve learned is that to bring the promise of large glass elements into the real world there are a few fundamental considerations that need to be successfully handled. As with any roof system, rule number one is to manage precipitation. The potential for bulk water intrusion increases with every joint in your assembly. Standards exist to certify water-tightness during heavy rain and inclement weather, and designers should be asking for such proof. Shedding bulk water is especially crucial for very low-pitch skylights and continuous roof glass, especially below 1:12 (<5 degrees). While satisfactory results can initially be achieved with wet-glazed systems, such roofs need continuous maintenance to remain watertight. A preferred, durable solution for these low-pitched glass roofs is a dry-glazed system with integrated secondary drainage below the glass, but outside the air barrier. The primary waterproofing is assured by drainage through an overlapping multi-stage connection which avoids direct joints. This provides a low maintenance, continuous drainage plane, and additionally provides the lowest U-values of both jambs and transoms from any available solution. The occupants’ comfort should be priority number one of the architect. This is a unifying design goal whether they are patients, residents, students, or customers. The decisions made regarding components that will have a major influence on comfort should be guided by state-of-the-art solutions. Roof daylighting can address this in a number of ways, beginning with the amount of available light. Roof glazing faces the sky and harvests daylight much more efficiently than vertical windows. Consequently, roof openings can be 3 to 10 times smaller than windows to provide an equal the amount of daylight. Additionally—with well-designed splays, wells, or shades—roof daylight systems can create very large expanses of evenly distributed light. In addition to increasing the amount of available light and reducing the need for artificial light, roof daylighting optimizes occupant thermal comfort through two crucial elements: Low U-value (triple pane) glass and thermal-bridge-free design. When these elements are not optimized, radiant discomfort from the glass and frame components can and will cause user dissatisfaction. A difference of just 7 degrees F between interior glass surface and other interior surfaces is sufficient to cause significant discomfort for occupants. Thermal-bridges at spacer, structure, or connections can cause not only significant heat loss but also cause condensation to form and drip from glass roofs and skylights. Roof daylight systems used should eliminate these conduits for heat transfer with advanced thermally broken components and superspacers in the glass. Manufacturers who have third-party verification to support such claims should take priority during selection. The most stringent certification of such performance for building components are administered by the Passive House Institute in Darmstadt, Germany. When is a leak not a leak? Quite simply, when it is condensation! Beyond the comfort concerns, thermal-bridging causes moisture formation on (or within) the frames of the insulated glass unit (IGU). Over time, this can not only stain interior finishes with drips but also damage the glass spacers, while ultimately will cause fogging of the IGU. Preventing this can be achieved by using systems that are truly thermal-bridge-free. Employing advanced materials at critical junctions that keep interior surfaces at or near room temperatures. To calculate the daylighting system’s ability to avoid condensation concerns, products that can show their fRsi value > 0.70 in climate zones 4 and colder should be used. This value is an essential criterion for the prevention of discomfort and damages. Environmental and fiscal sustainability both call upon building designers to weigh the energy impact of their decisions. Buildings account for 40 percent of all U.S. energy use. To increase a project’s energy efficiency, architects and engineers should collaborate in the design to create an optimal balance of the heat gains and losses through the building envelope. A glass roof can make or break that energy balance. Well-optimized roof daylighting can have a positive effect on the energy balance. There is no one set of specifications since it will depend upon the project location, but a lower U-value glass is an essential first step. In all but the mildest climates, triple-pane glazing is needed to prevent significant energy loss. The right mix of Solar Heat Gain Coefficient (SHGC) of this glass must be determined to prevent overheating in summer while minimizing heat loss in winter. A passive or active shading system can be integrated in the design to get gains in winter, while avoiding gains in summer. Keep in mind that low SHGC glass can implicate the visual transmittance of the glass. So maintaining a high visual transmittance factor for dazzling sky views should be a consideration. The maximum possible difference between visual transmittance and SHGC is around a factor of 2. For example, with a SHGC of around 30, as many prescriptive energy codes require, you could have visual transmittance as high as 60, which is still quite good. Methods such as bronze tinting have been used in the past to reduce the heat gain factors, but they have the negative effects of distorted outside views with a visual transmittance below 45—not unlike wearing sunglasses at all times. There is a world of options available for architects and engineers to complete the loop and connect practicality and performance with aesthetic ambition. Rather than considering it simply as a skylight, think of glass roof daylighting as a tool capable of performing double- or triple-duty. 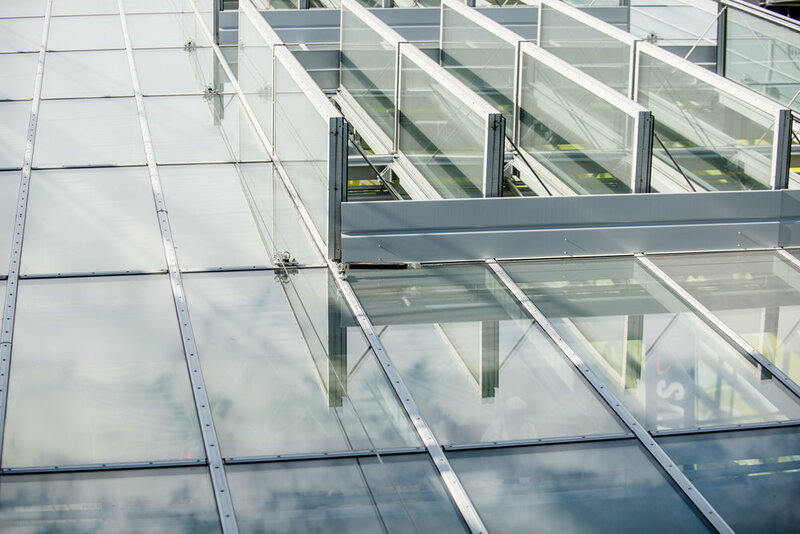 Once these glass roof components are tied to the building automation systems they can be used for ventilation in shoulder seasons, automatic night time cooling, or double as smoke vents, and even close themselves at the first hint of rainfall or high wind speeds. Glass roof systems do not eliminate the opportunity for solar energy on your building. Photovoltaic cells can be integrated into the glass to act as both a daylight element and net-zero power generator. As an added bonus, this is a solar array that occupants can see from the interior. It is possible to make a glass roof the centerpiece of your design while enhancing the overall performance of your building. There is endless design potential for residential, commercial, and institutional spaces (schools/universities) to be efficient, comfortable and daylit. Airtightness, moisture control, bulk water, condensate management, energy efficiency, and comfort optimization should be integrated into your next design. For your next high performance or net-zero project in North America, look to LAMILUX by 475 High Performance Building Supply for “Made in Germany” quality and Passive House Certified performance that delivers award-winning optimized roof daylighting that have been installed from Seattle to Martha’s Vineyard. Review a full range of project examples and possibilities for architecturally liberating design that incorporates our rules for roof daylighting.